The NFMA issues Recommended Best Practices in Disclosure papers and Position Statements, including White Papers and Comment Letters on developments in the municipal market. 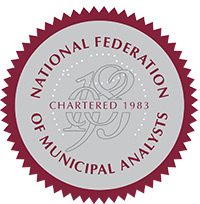 The NFMA publishes the Municipal Analysts Bulletin three times per year. NFMA members have access to the online Member Directory, Job Bank and Meeting Handouts. The NFMA also links to Muninetguide as an additional resource to members seeking a website with more comprehensive information about municipal credit.